Lately I have been studying historical hauntings, specifically poltergeist disturbances, which have better-than-average documentation. Because of differing views of the Church over the centuries, many of these cases were simply swept under the rug (which often happened when clergy were unable to help those afflicted) or hidden away in Church records as instances of "demonic visitation." One particular case, however, stood out above all the others because it was documented in 858 B.C., long before the influence of the Christian views on spirituality. The haunting was recorded by Pliny the Younger, and focused on a house in Athens where no one had resided for over a decade because of the bizarre events occurring there. The philosopher Athenodorus decided to rent the house because of its large size and reasonable price, presumably unaware or merely unconcerned about any kind of paranormal activity. Not long after moving in, Athenodorus was hard at work writing when the sounds of rattling chains disturbed his concentration. These sounds repeated nightly for a number of weeks, until eventually the philosopher noticed the noise was accompanied by an apparition of a man. The man made beckoning motions with his hand, but Athenodorus continued to ignore the disturbance for several nights. Eventually, lack of concentration prompted the philosopher to try and help the spectral man find rest. When the apparition came to him the next night, he followed it out to the garden where it led him to a hedgerow near the back of the property. The spirit pointed to the shrubs and vanished. Curious as to what mystery may reside with the spirit, Athenodorus hired men the following morning to dig out the hedges where the apparition had led him. There they made the grisly discovery of skeletal remains with its hands still in shackles. The body was exhumed and given a proper burial shortly after, and Athenodorus enjoyed his peace and quiet from that point onward. This story is fascinating in that it begins as a classic poltergeist case (only noises) and evolves into an intelligent haunt in which the spirit and the living communicate or interact. It is also notable that the entity appeared to have some sort of unfinished business tying him to the earthly plane - business that the living were able to assist in completing, therefore releasing the spirit to move to its next destination. 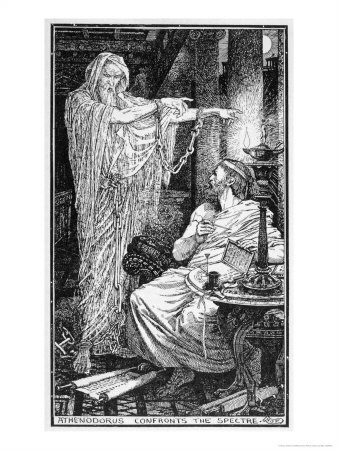 As I read this post, I wonder if the story of Athenodorus has influenced how most people imagine a ghost to behave - the rattling of chains has become such a cliche, especially with British writers throughout the ages. Where did we get the idea that ghosts make the sound of rattling chains? Maybe it came from this ancient story and illustration.